Thung Yor is a small village located in Krabi Province, southern of Thailand. Some of the village area is mangrove forest which is connected to the Andaman Sea by tidal streams. Most of the villager’s main occupation is in agriculture with a supplementary livelihood from coastal small-scale fisheries. So, due to their dependence on the fishing the villagers have placed a priority on the conservation and restoration of mangroves. Under CBEMR the priority is to restore normal tidal flushing. The community wanted to rehabilitate the mangroves but the traditional planting method would not work in this situation due to the disturbed hydrology. 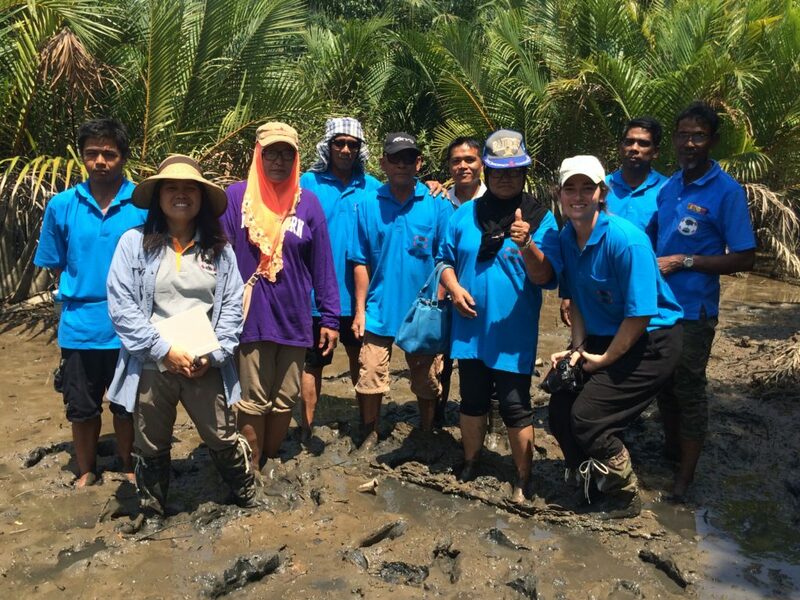 MAP introduced the concept of Community-based Ecological Mangrove Restoration (CBEMR) which was a completely new approach for the community but they trusted MAP and are determined to learn. then to a tidal stream according to restoration plan developed. Some members of Thung Yor took part in a CBEMR training workshop and field study tour (8-9 March 2017) to visit other CBEMR sites to learn the theory of this new restoration process. A restoration plan was developed for the site, following a full field survey including measuring the surface strata height of the pond bottoms using an auto-level. The hydrology improvement started by using a backhoe to make a drainage channel in pond #1 and breaching the earthen dyke for better drainage at the old sluice gate location (lowest point). The objective is to have rapid drain down of the pond similar to the nearby mangrove. The channel dug within the pond followed the water drainage pattern looking much like a natural winding stream rather a straight canal. The result was good tidal exchange which allowed mangrove seeds to enter into the site with each tide. Mother nature facilitates mangrove seeds to be dispersed everywhere in the ponds and the species start growing in the zone which is best suited for them. Seeds that end up in an in appropriate location do not fair well, die, or are out-competed by more favourable species for that location. This is a process of natural selection and results in a natural mangrove ecosystem rather than an even aged man-made plantation. Volunteer seedlings appear on site 2 months after hydrological restoration. No planting needed. Following just two months of normal hydrology exchange we undertook our first monitoring using time-lapse photos and the results were fantastic with many volunteer seedlings growing on the restoration site. Moreover, there are many different species of seedlings such as Rhizophora apiculata, Xylocarpus sp., Avicennia sp., Acanthus sp., Ceriops sp., Bruguiera sp. etc. The future of mangrove depends on you so please help nature to regenerate the mangrove. 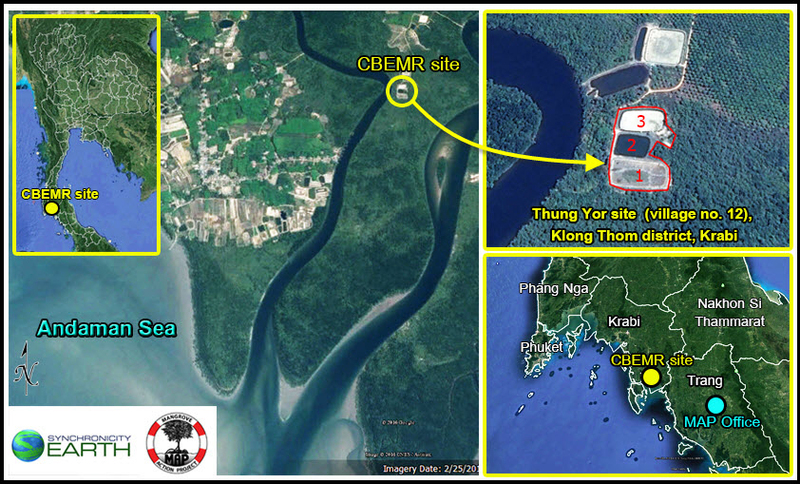 Note: The Thung Yor CBEMR project supported by Synchronicity Earth and MAP is part of SE’s Regeneration Portfolio.